Daniel E. Theberge was born in Lewiston, Maine on March 22, 1959. He spent his days as a young child in the nearby city of Auburn. It is in this town that Dan found his love for the camera, as he continually played with his fathers. He continued this love throughout his grammar and middle school days, taking his own camera everywhere. In high school, his interest grew into that of graphic arts with a particular zeal for photographic slides. This lead to his first job, at the photo department of the Lewiston Sun-Journal newspaper in 1976. Daniel graduated from Edward Little as a member of the National Honor Society in 1977, and continued to work for the newspaper. Two years later, in 1979, Dan left Lewiston to travel Europe and see the world. He spent this time backpacking and living on trains, building his first true photo resume. This photographic experience yielded over 700 photographs of various aspects of life in Europe. Two months later, Dan returned home to start showing his work to local businesses. In 1981, Dans first and only child Dylan was born. This lead him to work in the hardware field in order to support his family. Unfortunately, this would also lead to diminished time for his true passion in life -- photography. This did not deter Daniel from making his love into more than just a common hobby. In 1998, he opened Theberge Studios, and started selling black and white photographs with accompanying sketches. These sets started out mostly as the buildings of clients' businesses, but soon expanded into a wide range of free-lance shots. 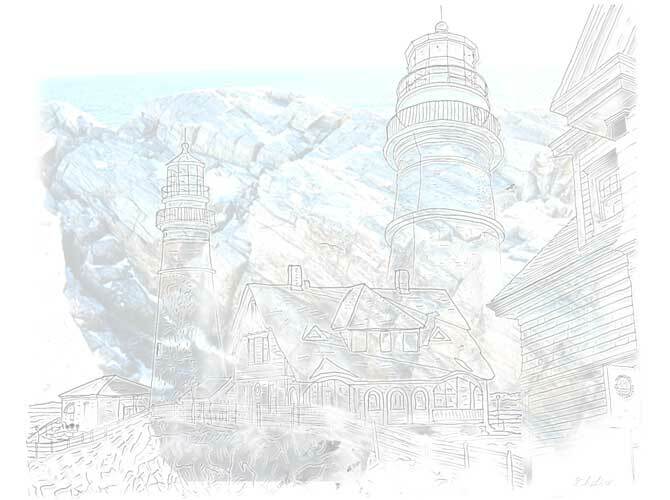 Dans love for lighthouses has kept him close to the ocean, his favorite atmosphere to work in. Always looking for that perfect coastal scene, or the different and unusual shot. The photos seen here are created by hand in a darkroom, with no use of any digital equipment. Daniel believes that this is a dying art that needs to be kept alive, and he strives in his work to preserve this process. Pricing applies to all photographs and sketches on this site. A photograph is captured on film, then is hand developed in a small tank. An original photo is then made using chemical trays and achieving the right look for the one and only print to be portrayed. After the print is ready to be framed, the artist will make a second photo from the same negative of which he will do his sketch onto. This print is very light in contrast and he will use it as a guide to do the drawing. After he has the perfect look to which he is striving for, he will use an old process taught to him on how to remove all the properties of photographic emulsions on the paper. Now he is left with a perfect photo-sketch, with all distractions removed. A template will be made of this original photo-sketch so as not to destroy the original. The original is very sensitive to light and must be stored. All of the work done is still done with a standard 35mm camera and the photos are developed in a small darkroom in trays by hand. No digital equipment has been used to capture the image or to do the first drawing. All the original ink sketches are done by the artist hand. The single first print will never be duplicated ever. It will remain one of a kind, with only quality reproductions being produced.